Having academic content available in the native language of English Language Learners is valuable for several reasons. One, it’s useful for teachers who use the widely-respected and thoroughly researched teaching method called “Preview, View, Review.” In this instructional strategy, the teacher first provides students with a quick introduction to the lesson in the native language; then the lesson is given in English; and, finally, a short summary is provided in the student’s first language. Two, it’s extraordinarily helpful in providing parents of English Language Learners accessible knowledge of what their children is being taught. This gives many parents who are not able to speak English the ability to better know what is happening in the classroom. They can talk more with their children about academic content and help them with their homework more effectively. And, three, students can access the materials — sometimes in class or at home — so they can develop a greater understanding of the subject matter and develop more self-confidence. Because of these reasons, I thought it would be useful to prepare a “The Best…” list of resources that I think provide the best multilingual and bilingual information about content typically taught in schools. This list is different from The Best Multilingual & Bilingual Sites For Learning English. There, I focused on sites that were focused on using the student’s native language as a tool to help them learn English. Here, even though use of native language materials an be used very effectively to assist students develop their English-language skills, these sites are not explicitly designed to do so. They have only been developed to provide content knowledge to speakers of languages other than English. In order to make it on this list, the resource must be provided free-of-charge, with no registration required, and be relatively engaging. Even though they charge for it, I do have to at least mention Brainpop. They have good Spanish versions of their videos though, unfortunately, the selection is far fewer than the number in English. Holt, Rinehart, and Winston has clearly been the major textbook publisher who has tried hardest to provide accessible multilingual information for all subject areas, including math. Unfortunately, they don’t take the word “accessibility” as seriously in terms of their website and, as a result, it’s periodically off-line (it seems to work best in Firefox). But they seem to be resolving some of those technical issues. HRW has a Pre-Algebra Glossary that provides translation of math terms and concepts in multiple languages. They also have similar glossaries for Algebra and Geometry. Also, for less-advanced learners, they have one for Middle School. Those direct links should work. However, if the HRW site is having one of its erratic moments, you can also access all of them at the main Math page. McGraw-Hill has two multilingual math glossaries — one for K-5 and other for grades 6-12. Harcourt provides a K-6 curriculum in English and in Spanish. I’m adding some additional resources related to math instructional videos in Spanish though, at the same time, I recognize that they might be of superior quality. One is the Khan Academy multilingual resources. They seem to have a number of resources in multiple languages, along with a separate YouTube channel for videos in Spanish. The richest man in the world, Carlos Slim, has also recently committed to have ALL their resources translated into Spanish. Tareas Plus has a huge number of instructional videos on math available for viewing, though it doesn’t appear that they have the same kind of follow-up exercises that Khan makes available. The videos seem to be available for free, and you can search for the ones you need. However, many of their video-based “courses” appear to require payment. Wendy Jennings, one of my colleagues, found a collection of about fifty Spanish-language instructional videos for Algebra 1 and Geometry. They’ve been created by the Northeast Arkansas Education Cooperative, and can be found on their site and on their YouTube channel. No matter what language they’re in, any math video is going to be “Greek” to me. But, Wendy likes them, so I’m adding them to this list. Carlos Slim, the Mexican billionaire, has just unveiled Acceso Latino, an online tool designed to be a “one-stop” site for Spanish-language “employment, education, health care, and civil rights” resources. Much of the site is just composed of links to materials others have created. However, there is some original material that could be useful to educators, particularly videos on different types of jobs and some decent, though surprisingly shallow, videos on content covered in the GED. Of course, as I’ve previously posted, Slim has also paid for all the Khan Academy videos to be redone in Spanish, and there’s a link to the Khan Spanish-language site, which is new to me. The British Council has math glossaries in several different languages, including Persian. 2) Click on Holt United States History 2007, which is the third one down from the top. 3) Then click on the chapter you want to read about. 4) At the bottom of your screen you will then see different languages. Click on the language summary you would like to read. HRW has good chapter summaries about Geography, though they’re only in English and Spanish. Once again, they can be a little tricky to get to. First go to their Geography home page, then click on the first title. Next click on a chapter and you will see the summary links at the bottom. HRW has similar summaries in English and Spanish related to U.S. Government. Go to their Government and Civics home page, and follow a similar process to the ones I’ve already outlined to get their bilingual resources. HRW has a great series of multilingual World History summaries in multiple languages. However, that page seems to be even more temperamental than their other ones. It seems to only work about half the time. To get there, go to the World History main page. Click on the first textbook, and then follow the usual procedure. McGraw Hill has both English and Spanish versions online of their California Vistas textbook. The Catholic Legal Immigration Network (CLINIC) has just performed a great service for recent immigrants by helping to develop and distribute the new U.S. Citizenship test questions in eleven additional languages. 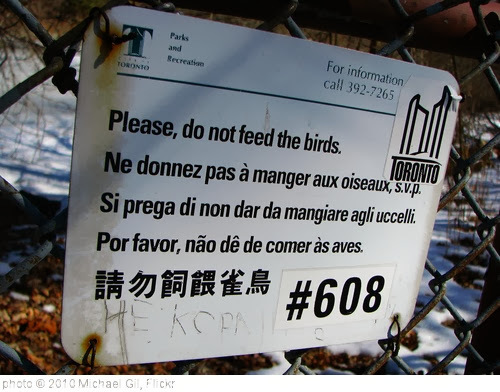 The U.S. government provides translations in four major languages. CLINIC has recruited community organizations from around the country to do these eleven, and are hoping to do more. A school district has created multiple social studies glossaries for topics and languages in downloadable PDFs. Another district has done the same. The United States Holocaust Memorial Museum has a ton of resources in multiple languages. In order to access them, you first have to search anything you want in the search box on the home page. Then, in the upper left hand corner of the page you’ll see a link to “Site.” Click on the arrow there and you will see links to different languages. Bilingual Study Notes – Social Studies Spanish is from NYU. McGraw Hill has an excellent series of multilingual summaries for their K-6 Science curriculum. Just click on one of the books, then click on a chapter, and then click on the “translated concept summary.” Here’s an example of what you’ll get. A school district has compiled multiple multilingual glossaries in PDF form for different languages and levels. The first two links on the list are dead-ends, but the rest are fine and can be downloaded. Another district has done the same. Phet from the University of Colorado has many online science simulations in multiple languages. Here are more Spanish Language NASA Sites. Carolyn Zierenberg, a talented teacher at our school, put together a simple multilingual (English/Spanish/Hmong) glossary of academic vocabulary. She’s given me permission to it on this blog and website. This Glossary of Commonly Used English Academic Vocabulary took an incredible amount of work to complete (if that link doesn’t work, you can access it here). utubersidad has many Spanish-language videos in history and in other content areas. Mundo from the BBC also has many resources in Spanish. Of course, a list like this is only effective as a supplement and follow-up to multiple classroom activities where these words are used in a meaningful way in context. Tween Tribune from The Smithsonian has accessible articles in English with Spanish versions. Newsela, a news site for schools, has now begun to provide Spanish translations of some articles, including providing them at different reading levels. Here is their blog post announcing the feature, and here’s a link to their Spanish-language text sets. The New York Times has just launched a Spanish-language site. It offers both articles translated from English versions and original content. Having good Spanish translations of their English articles can be great tools for English-language development, and the Spanish articles can also be used by ELLs to help develop background knowledge on a specific topic being studied. The Metropolitan Center for Research on Equity and the Transformation of Schools has developed an incredible collection of multilingual glossaries for just about every academic subject area and grade. ADDENDUM: Here’s an English/Spanish glossary for art classes. Edraak is a Arabic-language teaching and learning platform. It was started by the Queen of Jordan. As usual, additional suggestions are welcome. i agree with your idea,thanks!!! I agree with your ideas and appreciate them! The Glencoe Bi – lingual libraries are no longer working. If you have an updated link, I would appreciate it. I am mad that I used to just go in and run a copy and never kept one. The Glencoe math glossary still works but, you’re right, the science and history ones are dead. Thanks for letting me know. I’ve just replaced them with extensive glossaries for many languages that in downloadable PDFs. I could not find any online replacements. Glossary of Commonly Used English Academic Vocabulary is not working. Is there an updated link?